It's A Dan's World: AMERICAN GRAFFITI: Bucky Signed To 5-6 Picture Deal? Bucky Signed To 5-6 Picture Deal? 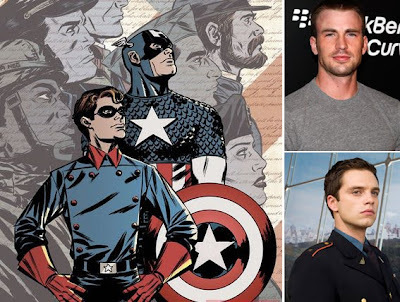 Not only has Marvel finally confirmed actor Chris Evans (The Losers, Sunshine) will play Cap in the upcoming movie, The First Avenger: Captain America, they have also nailed down the man who will be playing his WWII sidekick Bucky Barnes; Sebastian Stan. Yeah, 'Who's that?' was my gut response too. A relative newbie, Sebastian's main claim to fame lies in stints on Gossip Girl, the short-lived Kings and the recent Hot Tub Time Machine. While Marvel will only confirm the role is Shaw's, The Hollywood Reporter claims the young actor has being signed to a 5-6 picture deal, which hints at Ed Brubaker's seminal Winter Soldier story arc been positioned for future shield-slinging sequels. With Cap and Bucky now officially sorted, all eyes turn to who will land the roles of the other Invaders, Sharon Carter and of course The Red Skull. Didn't they announce Hugo Weaving as the Red Skull? Thanks for the comments Rob! Yeah 6 movies is an odd number - unless Marvel's looking at chucking him into the Avengers as well, but it's definitely a high tally like you say. Hugo Weaving has been listed as "in talks" to play Red Skull - but nothing official yet I don't think. Hopefully though - anyone whose seen the Matrix knows what a cold blooded villain he can play!